As per usual, previous winners and the top three from this year’s competition came back to compete for the title of Christmas champion. Could Tom, Jill, or Alesha add another trophy to their cabinet, or would Rachel, Kelly and Lisa finally get their hands on the prize? Matt and Alesha (Viennese waltz): Although I never thought Alesha was as amazing as the judges claimed, this was a nice Viennese waltz- it just felt a bit forced doing it to ‘White Christmas’. Good, but not memorable. Lisa & Brendan (quickstep): Now this is more like it- not the most polished of performances, but still an enjoyable and high energy routine. Even the music felt more fitting. Jill & Darren (American smooth): I had one major issue with this routine, and that was the music- the tempo seemed far too fast, and in the middle it just sounded downright messy. Had it not been so frenetic, this would have been a lovely dance, but as it was, it just needed to slow down and relax a bit. Rachel & Vincent (rumba): I know most will disagree, but as someone who didn’t really enjoy this rumba in the main series, I actually found myself preferring this version. It fit well with the music, and since it was the Christmas special, the lack of basic in favour of showiness was more in-place. Kelly & Brian (jive): With Brendan now partnering Lisa, Kelly Brook got to return with new boy Brian and make up for having to pull out after her father died in 2007. I must admit that this routine was very entertaining- although the non-jive start was confusing, it was enjoyable second time round, whilst the routine was good fun. A nice comeback. Tom & Camilla (foxtrot): The evening ended on a high note with this highly entertaining and polished foxtrot- the dress was nice, the routine was good and even ‘Rudolph the Red-Nose Reindeer’ somehow fit the bill. After a performance of ‘Let It Snow’ by Russell Watson- complete with a lovely accompanying foxtrot by Vincent, Flavia, Brian and Kristina, it was time to reveal the winner. After the others were eliminated, it was between Kelly and Jill; In the end, though, it was Jill & Darren who walked away with the trophy. I saw you made higurashi RPGXP charset. But there were only Mion and Rena !! All of higurashi member is needed !!!!! Would you make these As soon as possible ! Take this picture of each character. And Please don’t forget to make Hanyu, too. 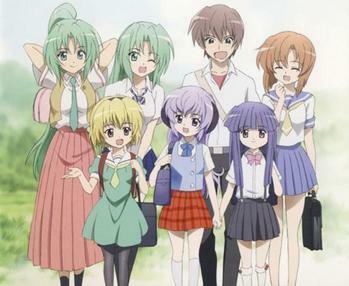 Hanyu is final member of higurashi.